The United States accounts for 25% of the Global Greenhouse Gas (GHG) emissions. To keep pace with growing electricity demands, the U.S and developing countries are turning more to coal-fired generation with correspondingly greater GHG emissions and other forms of pollution. Therefore, it is imperative to focus on what can be done to reverse this trend. At the same time, technologies for renewable energy generation and energy efficiency are available, and increasingly, these are being deployed on a cost-competitive basis. Environmental financial trading and the markets offer a solution and a way forward through Green Trading! Environmental financial trading began in the U.S in 1995 and has since spread to many countries. Green Trading Markets provides valuable information on continued U.S innovations in the context of the global development of green commodity markets. New ways of leveraging existing assets. New revenue streams and new opportunities for commodity trading. various approaches to improving management of greenhouse gases. Energy Risk Managers, Asset Managers, Renewable Energy Developers, Project Financiers, EHS Professionals, Regulators, Commodity Traders, Energy Hedge Fund Managers, Investment Bankers, and others related to the energy industry. Green Trading: Convergence of the Capital Markets and the Environment Peter Fusaro, Chairman, Global Change Associates Inc. Expanding Markets for Renewable Energy Certificates: Progress and Challenges Ed Holt, President, Ed Holt & Associates Inc.
Of Crystal Balls and Market Fundamentals: Anticipating GHG Prices Mark C. Trexler, Ph.D., President, Trexler Climate + Energy Services, Inc. Integrating Greenhouse Gas Emissions Management into Capital Projects Planning Arthur Lee, Principal Advisor for Global Policy and Strategy, Health Environment and Safety Department, ChevronTexaco Corporation, et al. C-Lock—A Method to Maximize Carbon Sequestration Value to Agro-forestry Producers and Purchasers Patrick R. Zimmerman, Ph.D., Director, Institute of Atmospheric Sciences South Dakota School of Mines and Technology, et al. Peter C. Fusaro is the best selling author of What Went Wrong At Enron; publisher of Fusaro Focus, a bimonthly financial newsletter; and chairman and founder of Global Change Associates, Inc., an energy and environmental advisory located in New York City since 1991. For 30 years, he has been at the forefront of energy and environmental change. His accomplishments include working on the lead phase-down of gasoline in the 1970s; fuel reformulation in the early 1990s in the United States as well as in the Asia Pacific region; creating energy efficiency programs for the NY/NJ Port Authority, including the World Trade Center; pioneering gas and electricity energy efficiencies programs for Con Ed (Enlightened Energy) and Brooklyn Union; identifying fuel-switching opportunities to natural gas for utility and industrial customers; and, for the past 14 years, working on GHG reductions. He has been advisor to the U.S. State Department as well as the U.S. EPA and U.S.DOE, the Japanese government, the World Bank, and many energy companies around the world on the energy and environmental change. Marion Yuen is president of The MYA Group which is a communications, research, and mediation advisory. A skilled facilitator and conference convenor, Ms. Yuen brings together diverse audiences and provides them with platforms for open and efficient face-to-face information exchange. Together with Mr. Fusaro, she created the Annual GreenTrading Summit™. 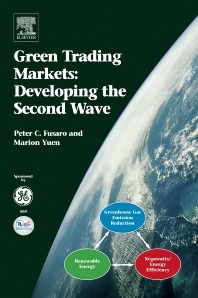 Ms. Yuen also contributed to and edited the book GreenTrading: Commercial Opportunities for the Environment. She organized a coalition of major power generators that sponsored the first Executive Conference on Safety in Fossil Power Plants (2001). She produced the 1999 Global Fuel & Power Forum, 1998 Global Electric Power Forum, 2000 & 1999 Biotechnology Investing Conferences, and in 1991, Ms. Yuen co-chaired the Advertising Research Foundation’s first Asian, Black and Hispanic Research Workshop. Ms. Yuen holds master’s degrees in Communications from Columbia University Teachers College and in Biophysics from the University of California at Berkeley, and an A.B. in Physics from Wellesley College as well as a certificate in Strategic Environmental Management from New York University’s Management Institute. Ms. Yuen is a certified mediator and arbitrator.